If you want to play a web based video while you work or multitask on the Mac, you’ll typically resize a small browser window and stuff it into the corner of your screen, right? 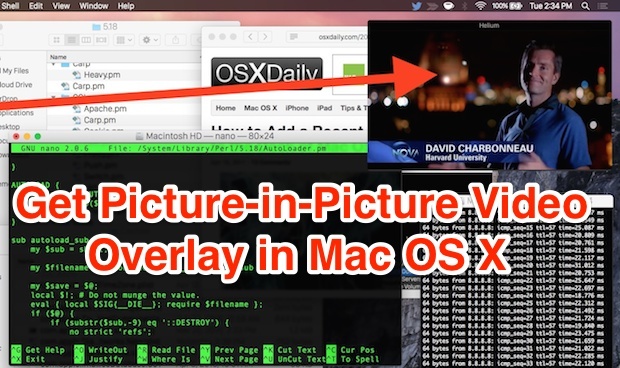 Rather than do that, you can use a neat little free app called Helium, which creates a floating overlay of videos and multimedia that you can hover over anything on the OS X desktop. The floating video is actually quite similar to the great Picture-In-Picture (PIP) feature that is available for iPad with iOS 9, except of course, the PIP video in this case runs atop whatever is on your Mac and OS X desktop. 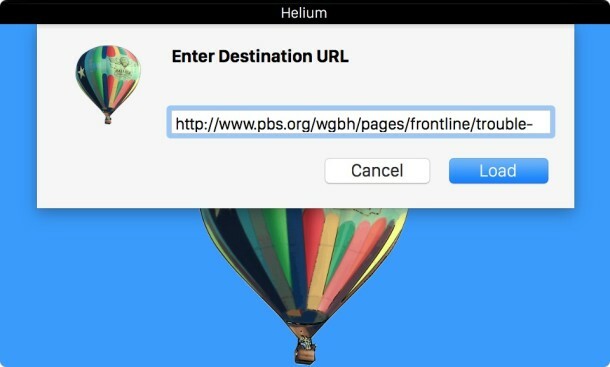 With Helium, you can work (or pretend to work) while you watch an online video, YouTube, TV show, Hulu, Netflix, Amazon, or any other video from the web, in the little floating window. It uses Safari webkit, so all plugins that you have installed in Safari will apply to the Helium player as well. Yes, of course sound works too, and basically if you can start or watch a video on the web, it’s safe to say you can overlay the playing movie over anything on the Mac desktop. 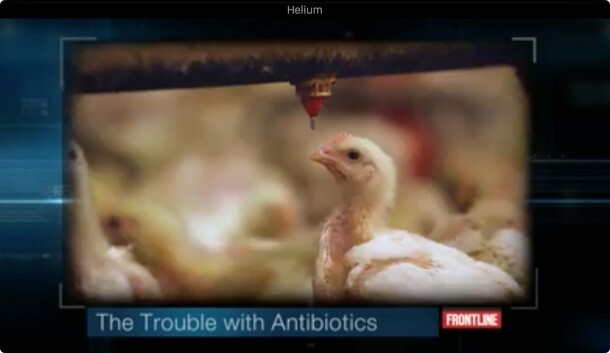 When you click the Load button the Helium window loads the page with the video in Picture in Picture, which you can place anywhere. Super easy, you now have Picture in Picture mode, it works to play a video over anything, whether you’re in Xcode, Microsoft Office, or deep in a Civilization game. The video below demonstrates how Helium works on the Mac, as you can see it’s very similar to Picture in Picture mode on the iPad, except the NOVA video is playing over an OS X desktop. This is one of those apps that is best tried yourself, so if something like having Picture In Picture mode appeals to you and your Mac usage, download the app and try it out. I think it’s useful enough that it would be a great future addition to Safari and the Mac in general, so perhaps we’ll see something like this natively in the next version of Mac OS. Also notable is that Helium picture-in-picture does not register mouse clicks when the translucency feature is in use, meaning you can click into the picture (or behind it, rather) to select a visible scroll bar, navigational element, highlight on screen text, or whatever else you’re doing on the Mac. Anyway, check it out, it’s pretty neat. Simple and very cool ! Except that it doesn’t work with Full Screen apps, which is how most of us work today so as not to have that clutter in the screenshots! Are you speaking for most of us, or yourself. If you still work in the clutter shown in the screenshots, then I obviously wasn’t speaking for you. BrooklynBob made a good point. And you did not say whom you were speaking to. You simply said “most of us” as if you knew that to be fact for everyone in the Mac world. Oh calm down. “Dah-veed” made a reasonable point. Many people do use full screen apps and if this plugin doesn’t work with them, then it makes it pointless. If you don’t use full screen apps, congratulations, it works for you, you have nothing to complain about, but you’re still complaining anyways. But also doesn’t work over Full Screen apps. The App Store doesn’t seem to have Helium, but it does have HeliumLift which it says is a revamp of Helium (developed by Justin Mitchell and Jaden Geller) and it claims to work in full-screen apps. 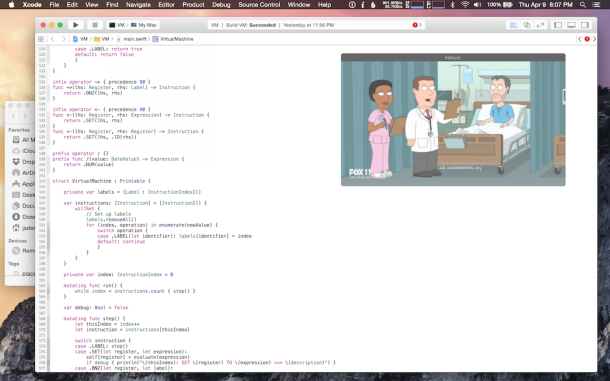 It does work with Full Screen apps, but it only works with URLs. The developer left out Helium’s ability to play video files already downloaded to your Mac. Now if we could only get both in one app! 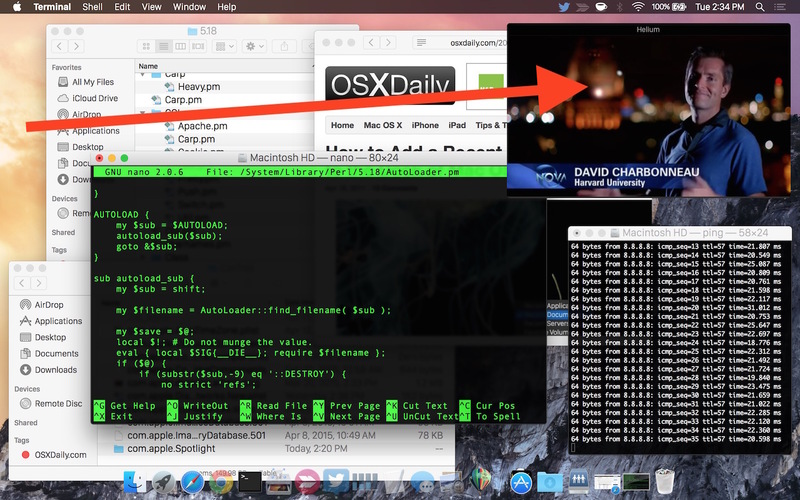 It does play mp4 files on your drive, choose Location > Open File… from the menu, or Cmd + O. Still wishing for an update to TransLucy or at least another developer to add in the transparency feature to their video app. Oops. Didn’t realize transparency was part of this app. That sure seemed to take forever. To make it more like a PiP experience, the developer should remove the Helium title bar. Nice app! ‘Picture in Picture’ in Mac App Store better than Helium.